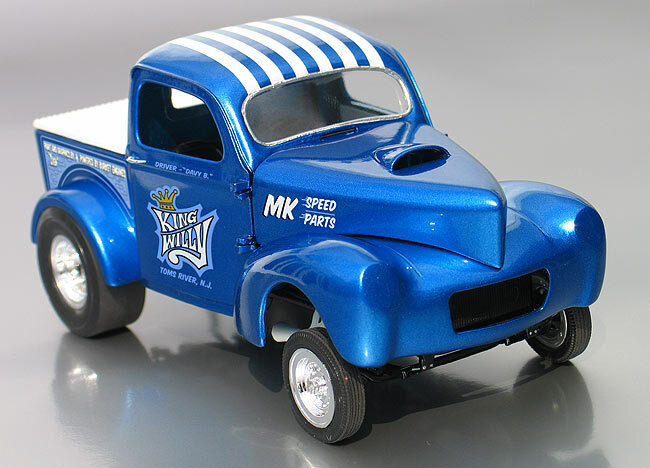 The second model kit package design I did for Model King is a reissue of the Revell Willys Gasser Pickup. In the early sixties drag cars were all business and a little on the crude side. By the late '60's and early '70's though, many cars had taken on a much more show worthy appearance. Chrome wheels, metal-flake paint, and wild graphics were the rage. The Centerline style aluminum wheels this kit comes with placed it in the '70's era, so I chose to design the theme for this re-issue around that style and give it an early '70's feel. Sometimes for the fictious cars I build I like to create a back story for the car. I envisioned this car as a car that might have originally been built for the "gasser wars" of the late sixties and raced somewhere locally. It was then updated sometime in the early '70s with new paint and some new speed equipment. 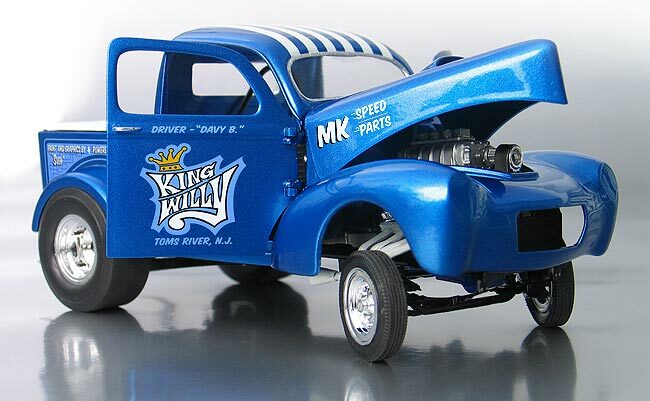 Dave and I also brainstormed names for the car and came up with "King Willy" as a nod to his company. First, I designed all new decal art work for this kit. It's a mixture of several types of stripes, panels, pinstriping and lettering meant to give it an authentic early '70's bracket racer flavor without being a replica of any specific car. 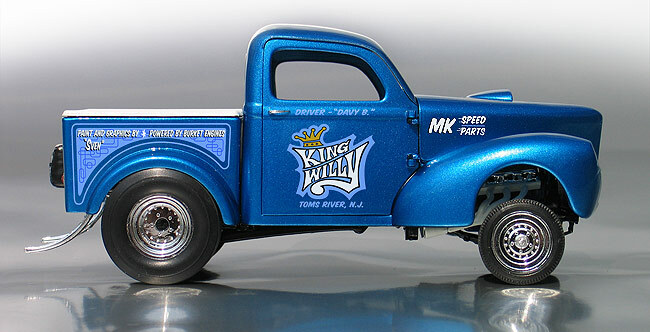 I designed a logo for the "King Willy" name and included it on the decal sheet. Dave also wanted to avoid licensing issues so I made up a series of fictious secondary sponsor decals. I also designed some extra stuff and added it on the sheet so builders could create their own version of the car or use them with another model. Normally, I modify the kits I build, adding parts from other kits, etc. For this model I wanted to accurately portray what comes in the kit so it was built straight from the box. I did change it slightly by removing the front grill trim and leaving off the chrome hood trim and headlights. 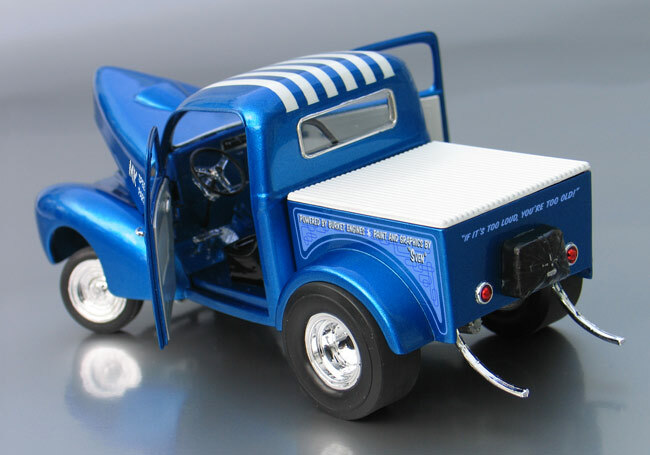 I thought it give the pickup a "fiberglass fenders look" which was typical of drag cars from this era. For those who want them, the Willys body trim pieces and headlights do still come in the kit if someone wanted to build it with those parts. This new re-issue also includes nice new one-piece vinyl tires which replace the old plastic two-piece tires seen in it's last re-issue. For paint, I custom mixed a bright blue metallic paint and shot it over a House of Kolor silver base which was then followed with a urethane clear. 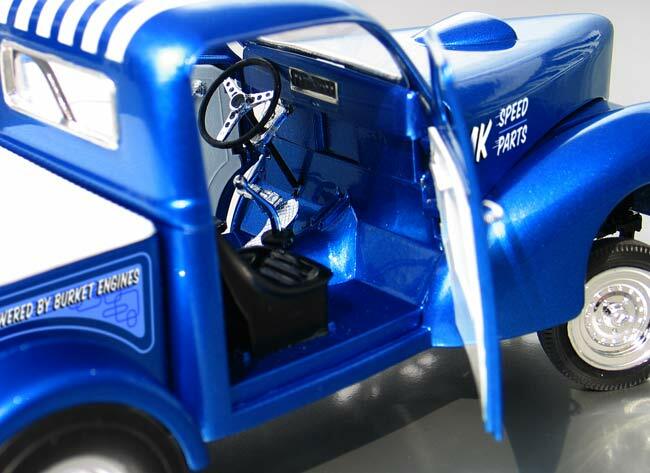 One of the neat features on this kit are the opening doors and possible front suspension. A little bit of care when assembling them and your car can come out looking very detailed. For the box itself (shown at the bottom below) I wanted to carry through with the '70's theme. I gave it an asymmetrical design with graphic panels wrapping from one side of the box to the next. I also incorporated the pin stripping art as a background motif. 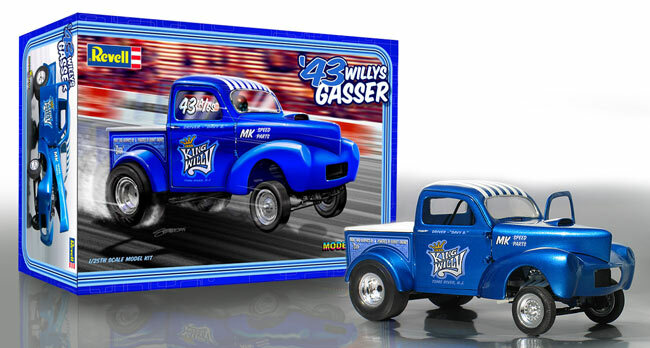 Again, I created a digital painting for the box top showing the "King Willy" blasting down the quarter mile, front end pointing towards the sky and on the edge of being out of control which is how a lot of these wild and wooly Willys often drove. 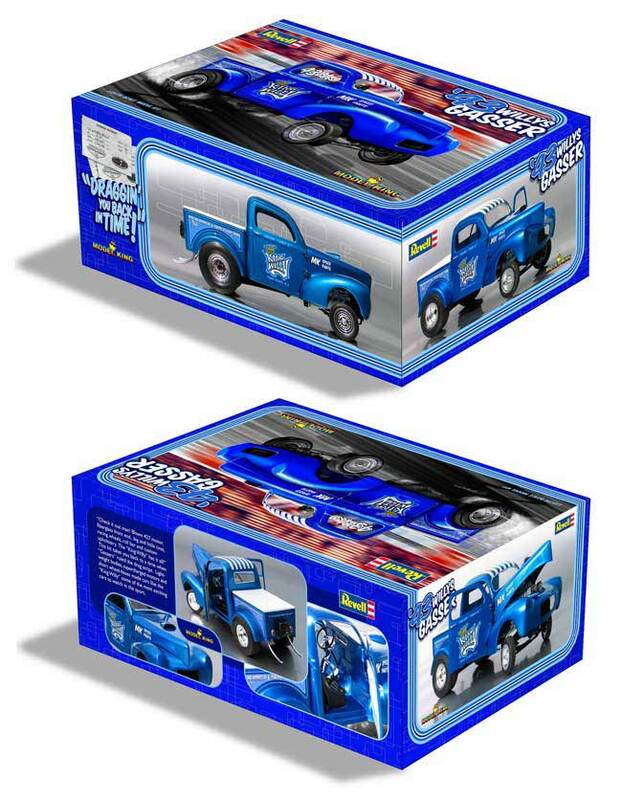 See other model car box art and decals I've designed.